The process of curing olives can be a complex one because different methods are traditional for different types of olives. The brine itself may be confusing as the liquid serves as a curing medium or to add flavor, depending on your method. The brines themselves, however, require little in the way of ingredients or technique. In general, you need 1 gallon of brine solution for every 10 pounds of fresh or cured olives. A curing brine uses liquid brine as the medium for curing the olives, which removes the bitter taste fresh olives have while preserving them. Brine curing brings about fermentation, which provides its own unique, salty flavor. Finish brines most commonly are used for water-cured olives. Water curing olives doesn't alter the olive's taste, so adding a finish brine is a way of adding extra bite to the water-cured olives' flavor. Using a third brine type, a preserving brine, at the end of various curing processes can lengthen the shelf life of the preserved fruit. For Greek-style black olives, mix about 3/4 cup pickling salt for every gallon of water. It's important to stir the salt vigorously until the salt completely dissolves. This brine gets poured directly over the olives, which are in one crock or several jars. After a week of curing, drain the olives and make a new brine. This second brine uses double the amount of pickling salt per gallon of water, and is used for the remainder of the curing process, which lasts about two months. Traditionally, Sicilian-style green olives come from a more complex brine, and seasonings such as fennel seeds, dill sprigs, garlic or peppers are scattered over the olives before the brine is poured. After dissolving 1 to 1 1/2 cups pickling salt (the bigger the olives, the less salt needed) per gallon of water, stir in 2 cups of 5-percent white vinegar. This combination will likely result in frothing and evaporation, requiring a replacement brine during the curing process. Use a ratio of 1 cup pickling salt and 1 1/2 cups vinegar per 1 gallon of water every time you need to cover all of the olives. Water-cured, oily black olives generally are finished with a Kalamata-style brine. The formula for this brine calls for mixing 1 1/2 cups of pickling salt with 1 gallon of water until the salt dissolves, then stirring in 4 cups red-wine vinegar. After this brine is poured over the olives, cover each jar or crock with a thin layer of olive oil. Green olives that have been water cured traditionally are gently cracked with a mallet, then topped with a Mediterranean-style brine. Dissolve 1 1/2 cups pickling salt in 1 gallon of water, then stir in 2 cups of white-wine vinegar. 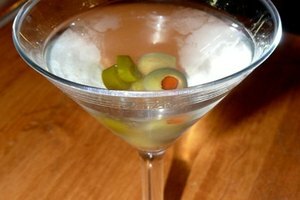 After pouring the brine over the green cracked olives, you may add lemon slices, garlic cloves or oregano sprigs. As a final step, some home preservers make a strong brine for use after olives have been cured by lye, dry salt or regular brining. This concentrated solution calls for an initial mixture of 4 cups pickling salt per 1 gallon of water, which you stir until the salt dissolves. After the olives have been in this concentrated brine for several days, pour an additional 1 cup of salt over the olives, and add a second 1 cup two days later. If the olives are in several jars rather than one crock, evenly divide these extra amounts of salt among the jars.